Imagine your Phuket wedding; with picture perfect scenery, stunning beaches and magical sunsets as the backdrop for your special wedding day. Your Phuket wedding will offer something special for everyone involved; with the Island’s unique blend of unsurpassed natural beauty, its rich culture and traditions, beautiful beaches and delicious cuisine. 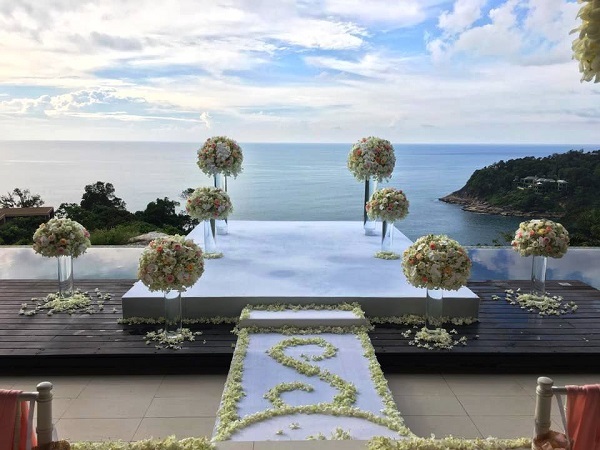 "Phuket weddings are what dreams are made of "
There truly is no better destination for a memorable, romantic wedding than on the Island of Phuket, there are countless romantic locations both on and off the island of Phuket. 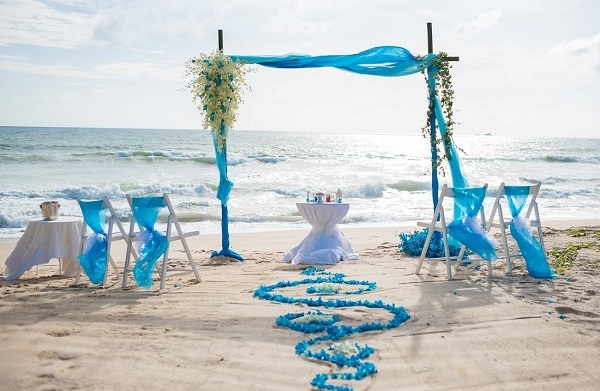 Beach ceremonies are one of the most popular settings, however, it doesn't stop there! There is an abundance of other beautiful locations and venues that ooze absolute romance, including spectacular garden settings, luxurious resorts, trendy beach clubs and private villas. Throughout our Phuket wedding guide, we will share with you the most affordable and unique wedding packages for your special day. 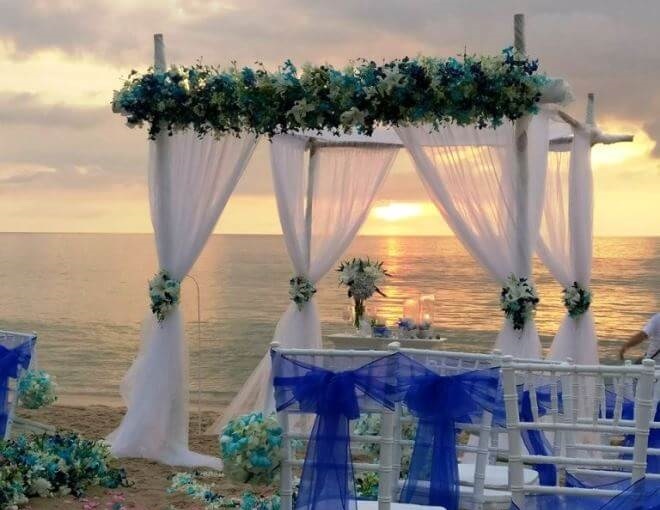 You and your loved one can be assured that the packages we show on our website are all organised by a highly sought-after professional wedding planner who is based in Phuket. With the planners in-depth knowledge and expertise of the Phuket wedding industry, you can be assured that she will go above and beyond for you. Carefully listening to your personal preferences, she will take care of absolutely everything, allowing you and your partner a totally stress-free destination wedding on the Island of Phuket. Let’s start by exploring the packages. Below you will see a list of the most affordable Phuket wedding packages, these packages will provide you and your partner with a range of different ideas for a romantic ceremony in Phuket. All the packages offer great value for money and are priced to suit all styles and budgets. A simple mini beach wedding is the perfect choice for the budget minded Bride and Groom or for couples wishing to renew their vows. This package has everything you could wish for and allows you the flexibility of being able to plan your special day in advance or if needed at short notice. 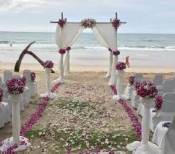 The standard Phuket beach wedding is one of the most popular packages. 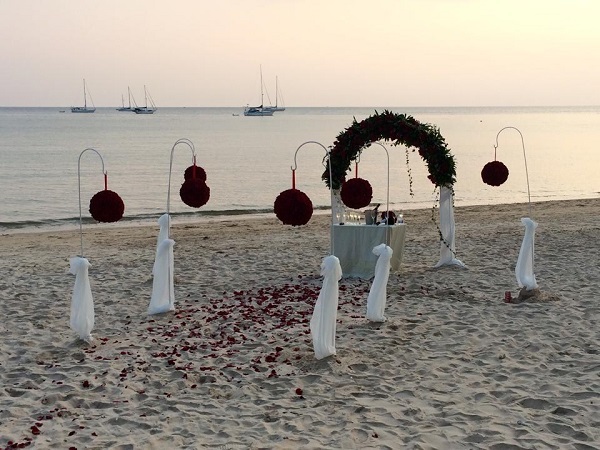 The ceremony is set on a secluded beach away from the crowds; evoking a romantic atmosphere for you and your guests. This package is ideal for a small group of family or friends. The superior beach wedding package is a romantic way to tie the knot and show your love to one another. With the sand between your toes and the sound of the ocean you and your partner and your guests will love the romantic backdrop of this beach setting. 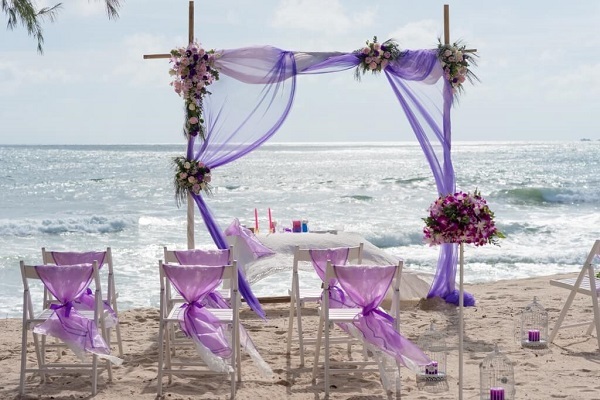 This ceremony is similar to the standard beach package; however it does include extra features and ideas to ensure your most important day is extra special. 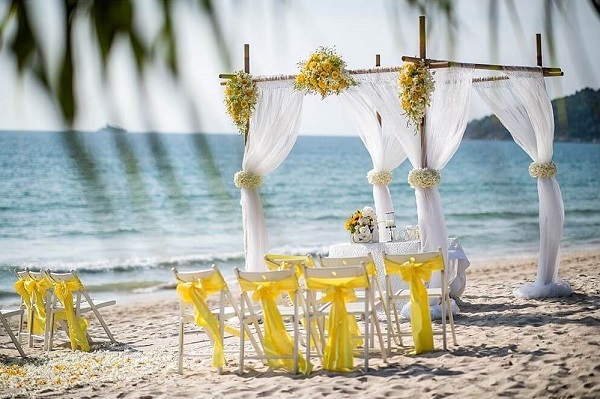 The Thai beach wedding package combines the harmony of a Buddhist ceremony with the romance of a western beach wedding that will create memories for you and your loved one to cherish and treasure for years to come. 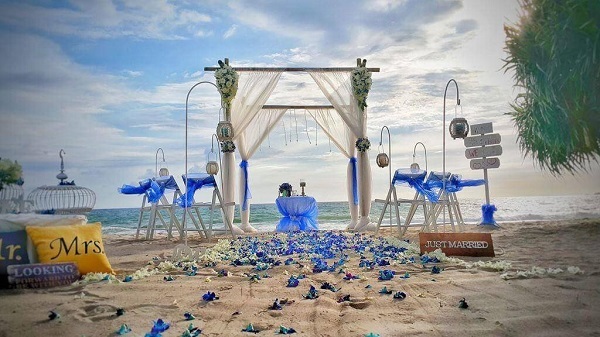 The exclusive beach wedding package is the finest of all the beach wedding packages, it is well suited for larger groups of family and friends. This all inclusive package has an excellent range of extras that you will love. 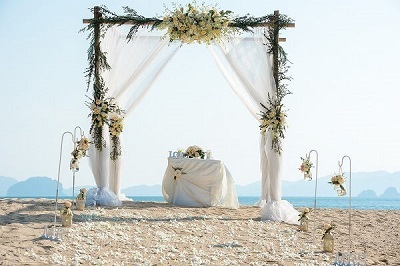 The ivory beach wedding package is unique reflecting the Thai culture, blended with a traditional western style ceremony. 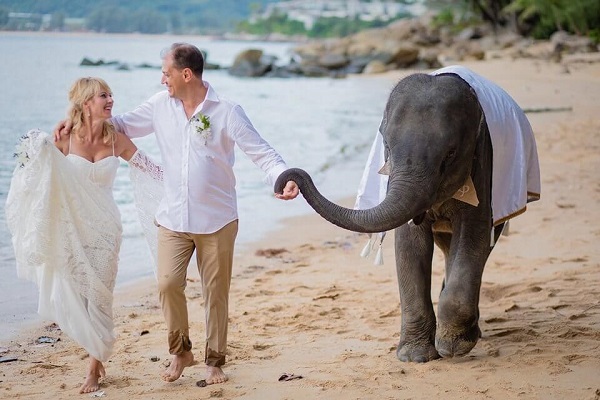 This package includes a monks blessing, followed by a ceremony on the beach where you and your loved one can have photos taken with a baby elephant. 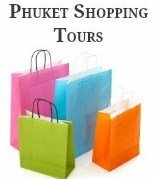 The Monks blessing and Island tour package includes a two or three hour tour of Phuket. Following the tour you and your guests will stop at Wat Chalong Temple, where the bride and groom will be blessed by monks. The monks blessing is perfect for couples wanting something unique or for couples looking to renew your vows. The traditional Thai wedding package is a spectacular display of colours, sounds and rituals that reflects Thai culture; the ceremony begins with a long drum parade, followed by rituals and a water blessing ceremony. The garden wedding package is ideal for couples who prefer not to have the feel of sand between their toes as they say "I Do". This packages comes complete with beautiful decorations and an abundance of hand-designed floral arrangements. 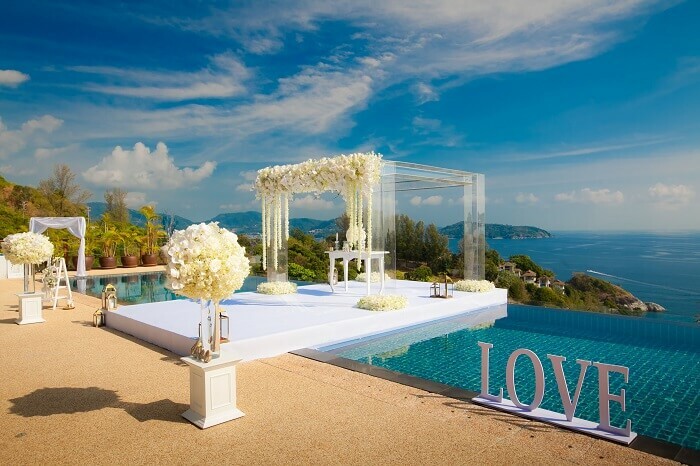 A villa wedding in Phuket is pure opulence and will ensure that you’re special day is truly unique with total privacy, so that you and your partner can enjoy your most important day in the exclusive company of your family and friends. 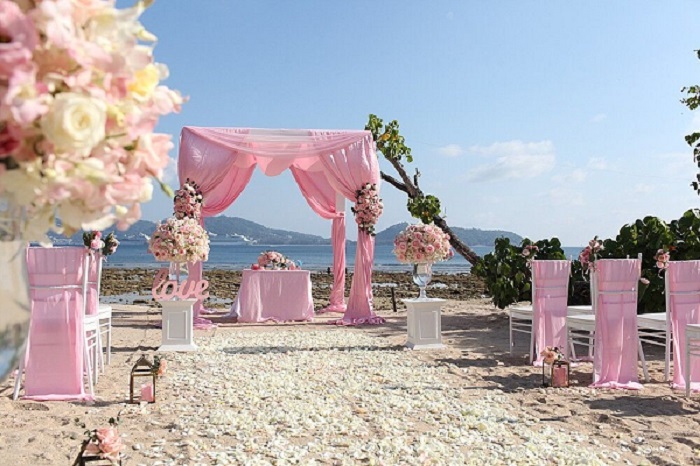 The Island wedding package is perfect for couples who want to tie the knot on one of the offshore islands around Phuket. The secluded tropical beaches and breath-taking sunsets, sets the scene for a romantic and intimate ceremony. If choosing one of the above packages is not exactly what you were looking for, you can also tailor your own destination wedding to incorporate your own taste, style and ideas, ensuring your wedding day is all that you have dreamed of. A boat wedding package is an ideal choice for something totally unique. This memorable package will see you and your guests cruising on the picturesque waters in Phang Nga Bay. The above packages can also be arranged for other destinations throughout Thailand. There are so many benefits of having a destination wedding in Phuket but the most obvious is to ensure that you have a ceremony that’s completely you. 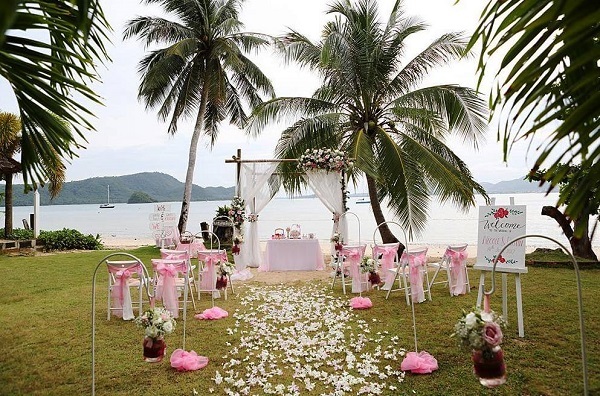 What makes having a Phuket wedding even better is the Island's accessibility, which is important not just for you and your partner but for your guests too. Phuket is only a short one-and-a-half-hour flight from Bangkok or there are direct flights from Sydney, Singapore, KL, Shanghai and Hong Kong. If you like you can read more about all the benefits of having a destination ceremony abroad. 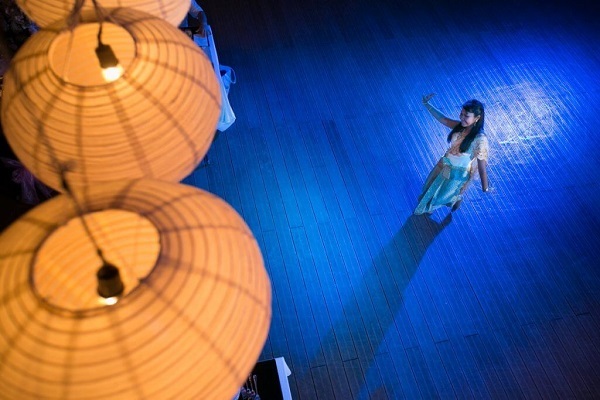 As you can see from the packages the options of venues for a Phuket wedding are endless as are the types of ceremonies you can choose from, including a traditional western style with non-denominational ceremony, or a Traditional Thai or Buddhist ceremony. No cermony is complete without beautiful flowers and floral arrangements which are all personalised and hand designed just for you or the services a professional wedding photographer to capture your most precious memories. When exploring the many possibilities of a Phuket wedding, ensure that you have your wedding planning checklist on hand and you have your finance in place, which for most ceremonies in Phuket isn't really needed as they are so affordable. Many resorts on the island also have all inclusive weddings, these packages usually include your accommodation, the ceremony and reception. If your planning to have a resort style wedding, contact our wedding planner on the form below as she will be able to assist you in finding the perfect location at the best price. Combine all these features and you have the reason as to why so many couples are deciding to travel abroad for a destination wedding in Phuket. The planner can also assist with organising guided tours with a registered tour guide for you and your guests. Now that you have the planning in place, it’s time to start exploring ideas for your honeymoon. There are many beautiful locations so take your time and explore some of the best honeymoon destinations in Phuket. Choose from one of our unique “Phuket Wedding Packages” for your special day or talk to our Wedding specialist to tailor your dream Phuket wedding.